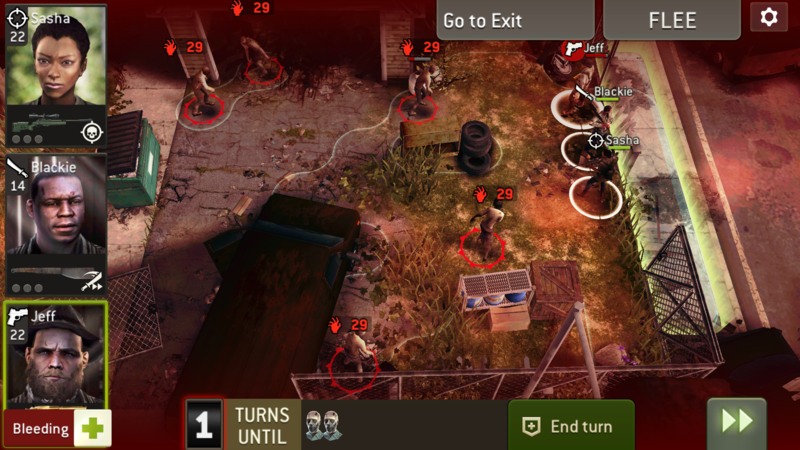 Today I noticed once again that my survivors loose a small amount of health in The Distance during missions and between. At mission 20 of todays run (Command center) I noticed that she was very low on health, almost down to red bar, and a then in round 3 she started bleeding for no reason. I am sure there was no hit involved, as this would have made her struggle a long time ago. I am not sure exactly why or when they start to loose health, but I am sure it happens. This gives a little bit harder than expected run, since now she cant take any more hits, also I needed to waste one turn for the bleeding to stop. I am not sure if the first Hit she took (in the middle section) involved some kind of burning damage If that continues somehow despite clearing a stage? Same thing happened to me today in The Distance. My shooter was low on health, and suddenly he losed health causing him to bleed and get the red bar. Does your Sasha have any health badges on her? Or were you using Abraham or Rufus as a leader when she first took a hit? No health badges, and I allways use Sasha as a leader in the distance when I use her. What I think might be happening is, that they have a bleeding from "outside distance", like if they are hit in an outpost or a mission with "freemen". I am not sure, but I have also had some of my heroes "burn" at the start of a distance. So nowadays, I try to make sure I dont finnish an outpost raid with any of my 3 raiders burning or bleeding If possible. Will this glitch ever going to be fixed? I've thought it was gone but just happened to me. 3 months old discussion and no answer from admins, this is nice.